While bottom turning on my very first wave ridden there, I was jolted when my fin struck the top of one of the infamous reef heads just south of the pier. "What the heck!?" I almost lost it but managed to keep my 9'6 Hansen in trim and pulled out right away. As I began to look more closely at the bottom underneath me I could see more of the reef that still dominates that area today. Then I began to notice those boils you see when sets pass over more shallow reef areas. My positioning and selection shifted as I began using boil markers to either lineup a takeoff or to avoid altogether on certain waves. Since then, I have been fascinated with bottom contours and their importance in selecting a surf spot on any particular day. So, just what is it that makes some breaks more desireable for fun, gliding longboarding and other breaks more desireable for performance, top-to-bottom surfing? We hear a lot lately about refraction swells in the Palm Beach areas on those big NE swells, but you may be surprised to learn that refraction plays a major role in shaping those memorable peaks at some of our local breaks as well. 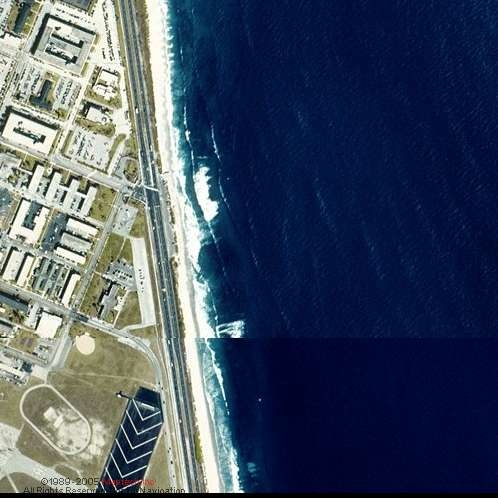 So just what makes a 3-foot wave break different at, for example, Cocoa Beach Streets, 2nd Light or Indialantic's Boardwalk? And why do some spots seem to hold the wind better than other spots? The bottom contours of our local breaks vary significantly. And, in some instances, that variance can exist between breaks only a few hundred yards apart from each other. The close proxmity of varying depths provide the variance that produces refractory wave action. Pier locals already know about the pier's wind protection and its deeper water underneath and nearby the pier's pilings. The pier can be a great spot on big days with strong northerly or southerly winds. But the pier is best known for it's flat bottom and gradual breaking waves. 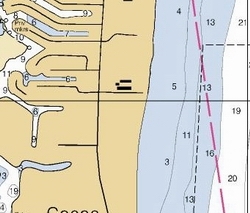 The nautical map (far right) shows how the pier area's water depth produces a softer, longer breaking wave ideal for longboarders and beginners. Refraction there? Yes! During both Northerly groundswells and some Southeasterly swells. Wave refraction occurs because those waves are at the best angle while coming full speed out of deeper water to create the "bending" effect. More on refraction here (thanks to University of Delaware's Ocean Engineering Laboratory). Note in the photo above how much bigger 2nd Light is than the pier on the same N swell 4ft @ 10sec. And, you can clearly see the lefts in front of 2nd Light's northernmost crossover are bending from the wave's Northerly fetch coming out of the deep water drop-off just 100 feet off-shore. 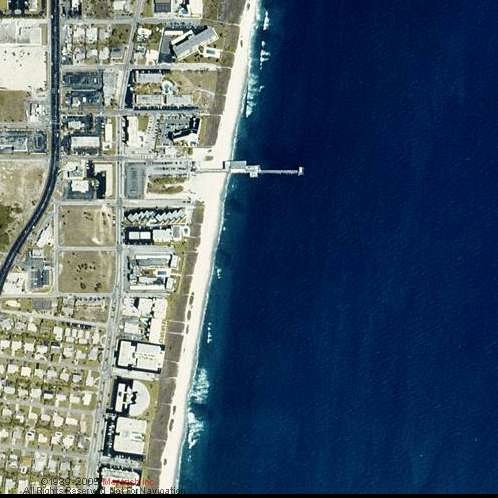 Compare the ocean depths off PAFB with those surrounding Cocoa Beach Pier (above). Scattered reefs providing additional wave energy combine with refractory bending to produce those classic peaks and angled speed sections we enjoy. 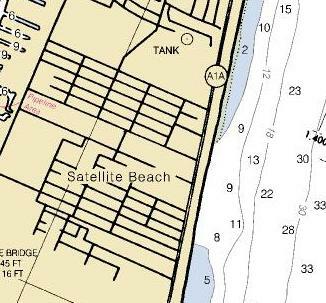 Note the very deep waters in a compact area off Satellite Beach. Refraction will bend waves that enter this zone at the right angle. Also, the extreme water depth indicates that this area may hold strong winds better than the surfing areas north and south of it. Constant wave action moving over and around the abundance of coquina reef through this area has caused the bottom to drop to 8-foot depths just off the beach. The chart shows why this area does not break on smaller days, but can be very fun on a 6ft NE swell. Waves approaching a beach over a wide, flat bottom will travel at a slower speed than waves approaching a beach from deeper water close to the surf break. 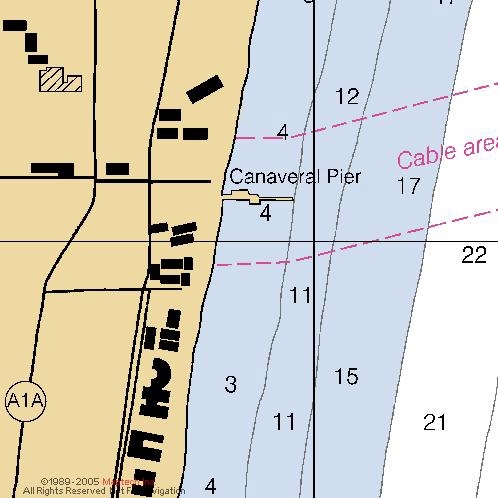 The nautical charts shown above reveal how different the bottom contours are off Cocoa Beach Pier, 2nd Light and Satellite Beach. The ocean bottom surrounding the Cocoa Beach Pier is flatter causing a slower moving wave and no opportunity for refraction angles to provide an extra boost. EXCEPT, of course, for those mini-refractory areas with 50 feet south of the pier's pilings ... where locals sit on the right peak that "mysteriously" bends to form a short but fast speed pocket towards the pier. 2nd Light has much deeper water closer to the beach with shallow water depths to its north beginning around 1st Light and continuing to Picnic Tables. There is sufficient coastal depth variance between the spots to produce refractory waves from northerly groundswells. But most of 2ndLight's refraction action come from NE swells coming out of 30 foot depths close to the beach, then suddenly hitting the reef's three-foot depths at just the right angle. Understanding bottom contours, refraction angles and shoaling can help you pick where to find some great drops on a big swell or where you can cruise forever on a shin-high day. 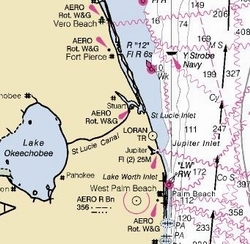 Below are Nautical Charts of other popular surf spots from MapTech.Com. 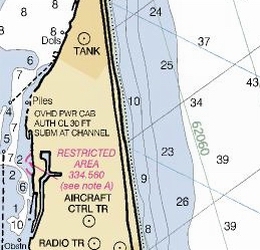 Future articles will focus on Canaveral Shoals, Reef Road, Secret Spot #3 and Sunset Beach, Hawaii. 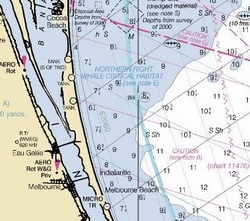 There are many great websites offering Nautical Charts showing ocean bottom contours at surf spots all over the world. So have a little fun and explore the bottom contours of your fav surf spots (or dive or fish). I like the maps and easy navigation of http://www.maptech.com and encourage you to begin there.